Alex served his apprenticeship in Leven with his father, John, a cabinetmaker who turned to making clubs, and he inherited the business in 1866 when his father succumbed in the cholera epidemic of that year. A good amateur with the Leven club, he left for Royal Wimbledon in 1886 to become professional there (pipping Willie Park to the job) with a salary of 30 shillings a week and a free shop. He left James Kinnell to look after the Leven operation. In 1891 he returned to Leven and recommended his brother, David, take charge at Wimbledon which the committee accepted though cut the salary drastically and made him greenkeeper rather than professional. Alex’s association with the club seems to have been a happy one as he called his house in Leven Wimbledon Villa. The firm's early cleek mark was a spur. Later it is of a lady walking through a horseshoe, either carrying water from a well, as some sources say, or taking her washing to the public drying green of the links, according to Alick Watt. 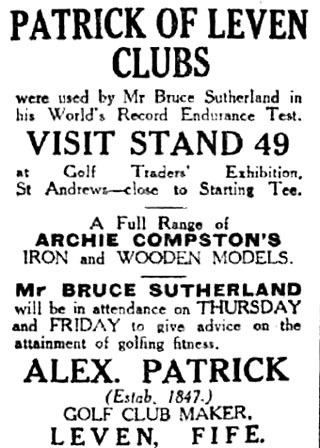 Popular clubs included bulldog and pug brassies and, later, a 'signature' range for Archie Compston, the Open runner-up in 1925. He exhibited at the 1922 British Industries Fair showing DJS and Acme clubs. At some point the business was sold to David Sellars (Patrick retired ‘after the [First World] War’) who continued to trade using the Alex Patrick name (as the advertisement from a 1927 tradeshow illustrates) but the business was bankrupt when Sellars died in 1936. Alex Patrick himself died in 1932 and, a keen member of the Leven Amateur Musical Association, he left them £500 in his will.